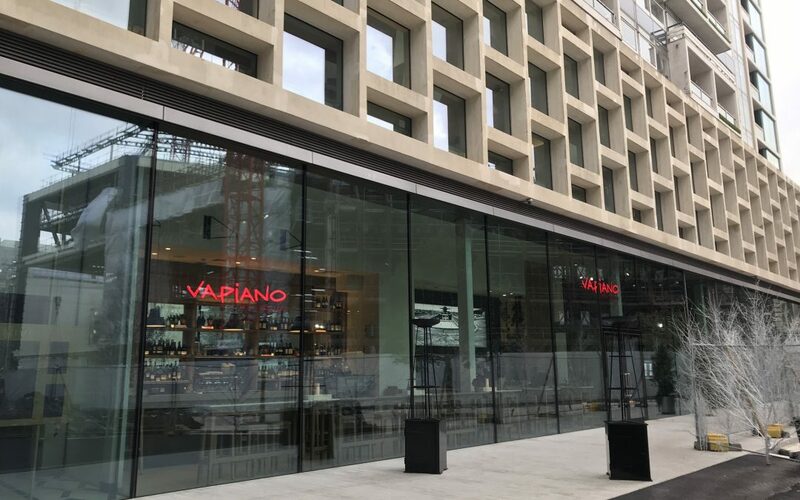 Vapianos launched their 5th restaurant in Centre Point at Tottenham Court Road in central London on Wednesday 12th December 2018. The restaurant is located in the centre point building ground floor, just in case you’re looking as when I was trying to find the location I was lost for about 10 minutes! Charging past Primark and Burger King in heels many times isn’t something I want any of my readers to encounter. Nevertheless, after a couple of calls, location messages and trips I found the beautiful new Vapianos. The ambiance was absolutely amazing as I entered the two floor establishment through flamed towers, a nice touch as it was extremely cold that evening. 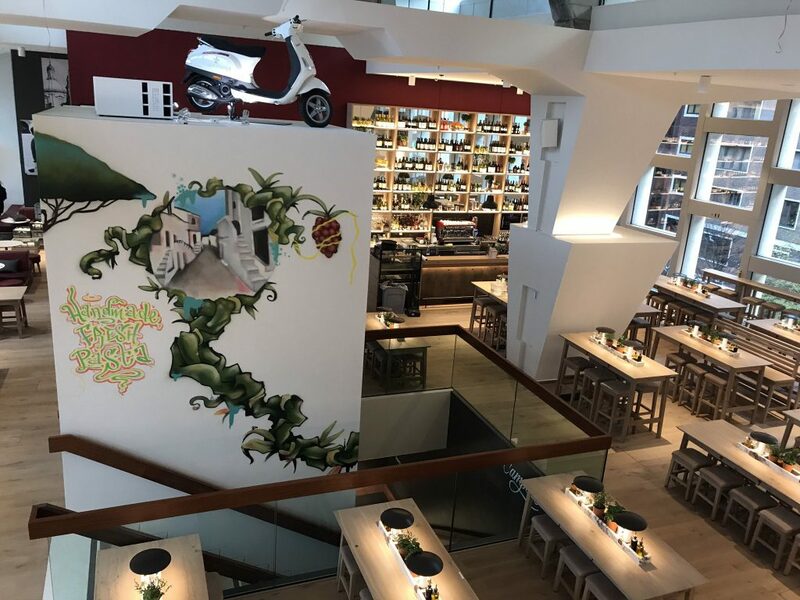 The beautiful interior design throughout Vapianos, which included tasteful artwork from @Graffitikings were aesthetically very pleasing to the eye. The wall which faced me whilst I walked up the first flight of stairs was breath taking, the art work which gave me a very warm and welcoming feeling. Up the stairs I went, where I was greeted by a table of complimentary prosecco, I added orange juice to suit my pallet preference. I was quickly greeted by friendly and informative staff who introduced me to the manager of the branch. The manager explained that there would be a range of dishes coming out on rotation. i would be sampling as many as i like. So the dishes are coming out thick and fast and I for one can’t wait to taste the scrumptious dishes which are being prepared right in front of my face. I am already a foodie and with all the aromas which are in the air, I want to eat it ALL! So I start with a Tomato and basil pasta dish which was quite plain but nice. A tomato base lightly seasoned with basil, this opened my appetite. This dish was followed by a carbonara style pasta dish which included pork pieces, cheese sauce and various herbs giving the dish the traditional Italian taste. An Italian base plain cheese pizza followed; at this point I was completely stuffed! The highlight of my night was when the owner of Vapianos took to the floor to give a hearty speech on the opening of the restaurant. He thanked everyone, from kitchen staff to cleaners, bar staff to bloggers, which I found humbling. The upbeat, charismatic atmosphere remained after his extremely humble speech. An amazing restaurant in an amazing location (once you find it), with healthy food options, which includes vegetarian and vegan options. Friendly staff and dedicated management who ensure you receive magnificent treatment from start to finish. An extraordinary launch night with an ambience like no other just away from busy hustle and bustle of Central London. Launch event for the opening of Vapiano restaurant in Tottenham Court Road!